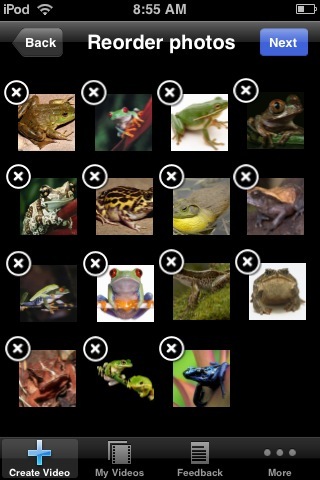 It is all go exploring the best mPortfolio (Mobile ePortfolio) option for the iPhone. If regular blogs are journals, Tumblr blogs are scrapbooks. The application is in beta and available now for Mac OS X and very simply to use. Why is this potentially a good thing? It enables you to capture the content of a blog/eportfolio and archive or burn it to a disc. Parents not wanting to let go of the hard copy of a portfolio can now receive a copy of a child’s portfolio to keep. Students moving on to a new school or leaving at the end of year 6, 8 or 13 can receive their learning journey as a momento or pass it on to their new school. The whole point of using an online space for an eportfolio is to have it available anytime and anywhere enabling the participation of others. 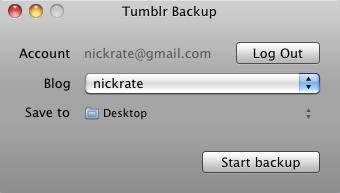 While this new Tumblr desktop app does not facilitate this process and is not designed to, it is great to know you can backup and store your blog, in simple HTML format, for whatever reason you have. I have been very interested in the concept of the mportfolio, the result of blending together the eportfolio and mlearning. I have blogged about this before, and here. This blog post is an attempt to pull together what is currently available now for options of creating and adding to an eportfolio through the use of a mobile device, specifically an iPod Touch or an iPhone. Why these devices? Firstly as an ADE, I promote the educational use of Apple products. Secondly, I own an iPod touch (not an iPhone…). Thirdly, the developments of apps and mobile integration of the Apple mobile platform far exceeds any other option, so therefore if there is an appropriate app ready to use it is more than likely to exist on the iPhone platform. This following breakdown is by no means exhaustive. Please let me know of any other solutions/apps that should be listed here. WordPress (Free):If your eportfolio is contained within a WordPress blog (wordpress.com, Edublogs or self-hosted) this is the app for you. Allows new post and pages to be created, images inserted (taken on camera or saved from web) and comments moderated. Draft posts can be saved locally if offline and posted when connected. 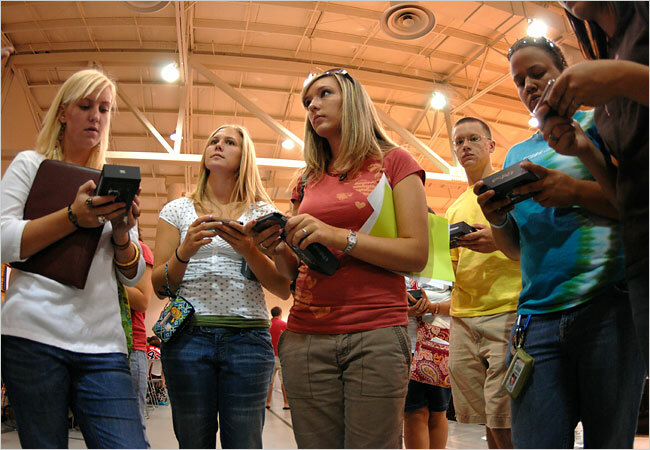 More than one blog can be administered, so you could set up a class of student blogs/eportfolios. The ability to post learning/reflections is excellent but the app does not directly facilitate other stakeholders giving feedback on learning. this would have to be done through a web browser. The app is very easy to use and has worked seamlessly for me when used on this blog. 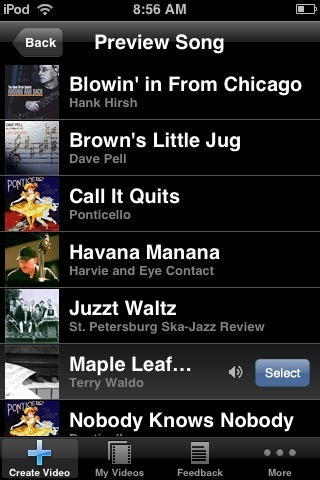 App in beta for BlackBerry phones. Evernote (Free): Evernote for iPhone lets you create notes, snap photos, and record voice memos that you can then access any time — from your iPhone/iPod Touch, computer, or the web. The notes are synced to your online space on the Evernote site, this becomes the container for your eportfolio/learning. The notes can be made public or shared with others at your discretion. However a note cannot be commented on directly, as in a blog post, for feedback purposes. If you were to upgrade your free Evernote account to premium (US$45/year) then others you have shared notes with can edit or add to them, allowing a kind of commenting/feedback feature. Also the free account has an monthly upload limit of 40MB. The app works well and syncs perfectly with the online space. The ability to embed or cross-post notes into a blog would be awesome! Limited to one Evernote account per iPhone/Touch.App also available for BlackBerry, Palm Pre and Windows Mobile phones. BlogPress (NZ$4.19) & BlogPress Lite (Free): Similar to the WordPress app but dedicated to Blogger blogs. The full version allows uploading/inserting of photos (to your Picasa account) and movies (to your Youtube account) into posts. The lite version is limited to just photos. As with the WordPress app, draft posts can be saved locally if offline and more than one blog can be administered, so you could set up a class of student blogs/eportfolios. The ability to post learning/reflections is excellent but the app does not directly facilitate other stakeholders giving feedback on learning. this would have to be done through a web browser. An added feature unique to BlogPress is the ability to the post the same post to multiple blogs which could come in handy if as a teacher you wanted to post the same message to all or a group of students blogs/eportfolios at once. 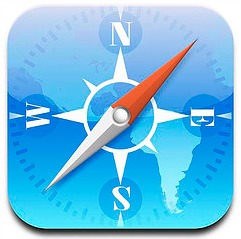 Safari: The standard web browser on the iPhone/iPod Touch. Needs to be mentioned here as it allows connection to any online service that may contain your eportfolio or elements of. Works well and is the only way to add links and other features to the body of your text in blogs posts etc. Makes web browsing a great experience on a mobile but dedicated web apps are much more intuitive. Tumblr (Free): Conceptually very similar to Evernote. Upload text, photos, quotes, links and audio (i.e. learning, reflections etc.) 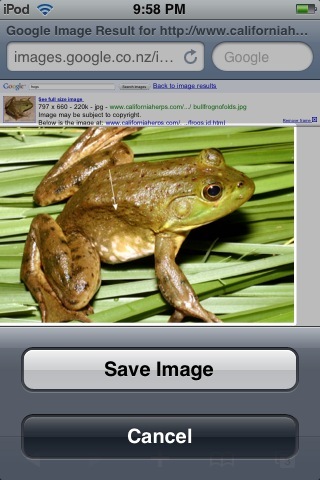 to your Tumblr blog/eportfolio directly from your iPhone/Touch. Post can be saved locally and uploaded at a later time. 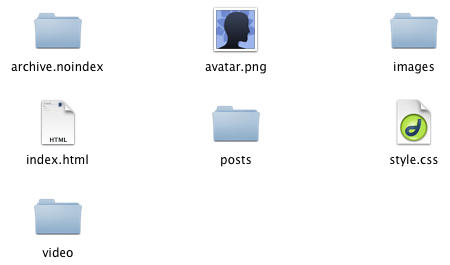 Integrates with other web containers such as Facebook and can also broadcast to such services as Twitter. Many more features through web site. Easy to use. Limited to one Tumblr account per iPhone/Touch. Comments and feedback on posts can be made through your web browser rather than the app. BlogWriter (NZ$2.59) BlogWriter Lite (Free): Allows posting to WordPress or Blogger blogs. 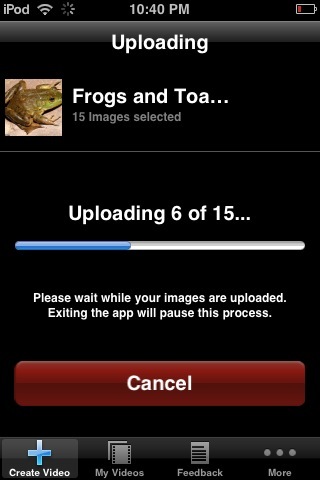 Full version allows photo uploads with geotagging but free version is limited to text only posts. Also includes an RSS reader. Interface is a bit clunky and visually not that appealing but the app does what it says it will do. I have included it here but prefer the free WordPress and Blogger apps over this. Tubey (NZ$4.59) Tubey Lite (Free): This app did not work for me but I thought I would mention it here as the concept is great and has potential to be used as a component or contributor to an eportfolio. Tubey allows the user to click, upload and share. Using the iPhone’s camera or any saved images, these are imported into the app, titles/transitions added, and the really fantastic part, narration can be recorded to explain what the images (learning) is showing, the movie is then uploaded to YouTube and cross-posted to your Blogger blog. Potentially cool, but kept returning an error for me and had no movies successfully uploaded. So what does all this mean? Essentially what this shows is that the mportfolio can happen and quite easily if the container for it is a well known blogging platform such as WordPress or Blogger. These two platforms are well catered for in terms of apps that can post content. However for me it has opened another chapter of my own eportfolio developemnt to the reality of a more streamlined, less time consuming eportfolio through sites such as Tumblr or Evernote which are easily catered for on the mobile platform and through traditional means. That would be an eportfolio that captures the process instantly through rethinking the capturing and posting learning, and thoughts including written, visual and spoken with the use of an iPhone (or the continually rumoured iPod Touch with camera). I had never really considered Tumblr or Evernote to be a serious contender in the eportfolio stakes but when I see the ease of capturing learning evidence on a mobile device and uploading it, I am almost converted! Others are too, various blogs post describe the potential such as here. However before I convert fully, I need to read some of the fine print regarding accounts for students and also investigate privacy/security issues. So to finish, there are plenty of apps that support an existing eportfolio especially if it is contained within a blogging platform. However these apps are only designed to post new information or edit existing content, but don’t support the ability to directly participate, comment, provide feedback in the eportfolio. To do this one must use a web browser either on the mobile or on desktop computer. What would be really great is if an app was developed specifically for commenting on blogs, much like the WordPress or BlogPress apps allow specific posting to their respective blogs, an app could allow commenting to a WordPress blog and a different app to a Blogger blog. Either that or it could be a feature of the already existing apps. Next post will look at mportfolios from the eportfolio tool perspective. For example, if your eportfolio is contained in an Elgg installation, how can the iPhone support and allow posting to it? Should be interesting. My earlier post about the iPhone and its suitability to be the hub of the ePortfolio or even your PLE, has taken another turn as the Apple rumour mills get into the “What’s going to be available for Christmas 2008?” mode. 9to5mac.com this morning wrote UK report claims iPhone nano for Christmas on their website. Pictured above, the phone will cost Â£150 and be available on prepay. Sounds promising if it is to be believed. Just like the MacBook touch rumours… or here. Looks to good to be true, but wouldn’t it be cool?! 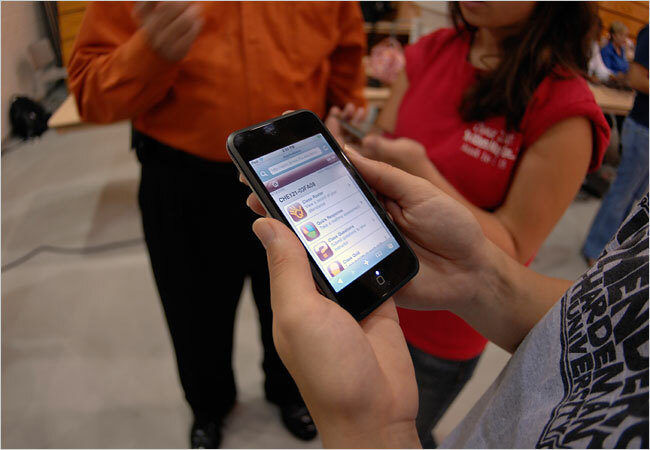 iPhone – now the perfect eportfolio gadget? I have previously blogged about the potential of the iPhone as a tool for generating and uploading content and reflections to your ePortfolio. This was before the release of the iPhone 3G and the brilliant WordPress app for managing your WordPress blog. This is a pretty nifty app which has been described in more detail here, here, here or here. There is plenty of evidence of bloggers using the tool and helping with it’s development. You can view these posts, such as this from the highly respected Dr Helen Barrett and others. The really great thing about this web app is that it also works from your iPod Touch too, as long as you have updated to the v2.0 software. (Don’t worry if you don’t have a WordPress driven blog, there are still 13 other options described here for blogging using the iPhone or iPod Touch). This web app and others (10 million apps in total were download in the first weekend) designed for the iPhone and Touch really hold the potential for the educational benefits of these mobile tools. While the iPhone carried with it the hype, anticipation and desirability, it is still a device which lacks in certain areas. But for me, the learning potential lies not in the hardware, but in the apps that are being developed to support learning. This of course is not a new concept at all, the technology should not drive what you are doing. It gets me really excited to see that a concept that wasn’t really practical or workable a few months ago has been made possible with the arrival of the iPhone v2.0 software and the WordPress web app. What I would give to be able to afford a class set of iPhones (or iPod Touches!) to really explore this phase of elearning..